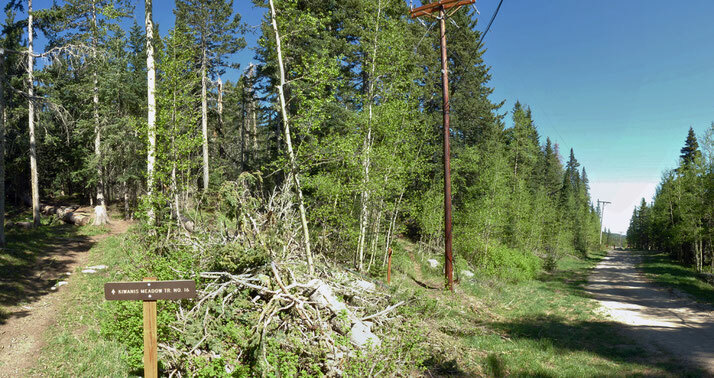 If you're looking for easy, tree-shaded hikes that kids can do, check out the network of trails between Crest House on the west, the Ellis Trail head on the east, NM Highway 536 on the north, and Kiwanis Meadow on the south. Hikers can also use the trails to do long loops north and then south, without having to walk along NM 536. Until recently, the trails were a confusing mess, but as of June 2017 that's changing rapidly. Volunteers working with the Forest Service are improving the trails and marking trail intersections with signs. You can use a recently created map (click on the thumbnail below) and the signs to navigate the local trails without getting lost. Even more help with that in a bit. The trail network below Crest House started out as cross country ski trails, so the gradients are gentle—one reason the trails are good for kids. It's even possible to work Crest House into a family ramble, so that kids can be bribed with snacks (and adults with espresso) before, during, or after the day's adventure. Click on the photo for a larger version you can print out. The trail system is complex enough that even with a map and signs, you may not be sure where you are. As a fix, I'll provide a sketch map with numbered trail intersections tied to GPS readings. My narrative will assume that you park at the Ellis Trail Head parking area and pit toilets (there's a clearly marked turnoff at 35 deg. 12.563 min. N, 106 deg. 26.473 min W) and head uphill from there. Trails are identified by their official number. Intersections are marked by circled arbitrary numbers. Once parked at the Ellis Trail Head, head back into the trees (SSE) on Service Road 488, past the gate. At Intersection 1 (shown as ➀; 35 deg. 12.434 min. N, 106 deg. 26.439 min. W), turn right and take the Kiwanis Meadow Trail (16). Or just a few meters before that point, turn right to start up the Switchback Trail (271). If you take the Kiwanis Meadow Trail you reach the Crest Trail (130) at Intersection 2 (shown as ➁, and so on), at 35 deg. 12.328 min. N, 106 deg. 26.457 min. W, where you turn right. If you take the Switchback Trail, at Intersection 3 (35 deg. 12.469 min. N, 106 deg. 26.478 min. W) turn left to stay on that trail. (If you continue straight you'll be on the Survey Trail  and heading out of the Crest House area.) At Intersection 4 (35 deg. 12.398 min. N, 106 deg. 26.503 min. W) the Switchback Trail and the Crest Trail merge for a while; turn right and continue uphill. At left, the start of the Kiwanis Meadow Trail (16). At center, the Switchback Trail (271) begins just left of the power pole. At right, looking down Service Road 488 toward the Ellis Trail Head. About 100 degrees compressed into this view. At Intersection 5 (35 deg. 12.442 min. N, 106 deg. 26.620 min. W) the Crest Trail and Switchback Trail part ways. If you head on up the Switchback Trail, almost immediately you'll come to an intersection where the Buried Cable Trail (272) begins. But let's assume that you stay on the Crest Trail. At Intersection 6 (35 deg. 12.417 min. N, 106 deg. 26.655 min. W) you'll come to the intersection with the Kiwanis Cabin Road (94). A left turn takes you to Kiwanis Cabin and a right turn takes you to Crest House. But we're still headed up the Crest Trail. At Intersection 7 (35 deg. 12.415 min. N, 106 deg. 26.792 min. W), very close to the Sandia Crest, you face a pleasant dilemma. Turn right onto the Crest House Nature Trail (98) and you have a shady trail with interpretive signs, but if you stay on the Crest Trail it takes you to dramatic views from the ridge crest. The nature trail and the Crest Trail rejoin at Intersection 8 (35 deg. 12.517 min. N, 106 deg. 26.877 min. W), at which point you're a short hop from Crest House. South Sandia Peak (and beyond, the Manzanos) as seen from the Crest Trail near Crest House. Photo taken on a hazy day. After cappuccino on the deck at Crest House (someone's gotta do it), you can start down the trail system from the south end of the lower parking lot (head south from the helipad circle). At Waypoint 9 (35 deg. 12.549 min. N, 106 deg. 26.867 min. W) you'll pass the gate for the Kiwanis Cabin Road (94). At Intersection 10 (35 deg. 12.539 min. N, 106 deg. 26.845 min. W), turn left if you wish to take the Switchback Trail (271) back down to the Ellis Trail head. At Intersection 11 (35 deg. 12.603 min. N, 106 deg. 26.853 min. W), you can turn right onto the Buried Cable Trail (272) to bypass a long switchback in the aptly named Switchback Trail. If instead you want to extend your outing, follow the Switchback Trail to Waypoint 12 (35 deg. 12.865 min. N, 106 deg. 26.959 min. W), where the trail doubles back on itself. Once you're back at Intersection 5, you'll be retracing your steps back to your car, either via Intersections 4-3-1 or Intersections 4-2-1. The series of short connected trails below Crest House offers other options for easy loops in the woods. If you just learned how to navigate with a GPS unit, this is a good place to practice your new skills: there are lots of intersections to navigate to, with signs and maps to back you up.